By Charles Moffat - February 2012. Also known as Eco-Fashion, sustainable fashion is a growing design trend in the fashion and textile industry wherein the goal is to create environmentally friendly and socially responsible clothing. There is also a larger trend called sustainable design, wherein architecture and products are made with special consideration for their environmental and social impact throughout its total life span (meaning the product doesn't pollute or harm during production, usage and eventually disposal), including efforts to minimize its "carbon footprint" for transportation. Sustainable fashion has been getting a lot more press in recent years, appearing in magazines like Vogue, but that is only because the staff at Vogue noticed the growing trend of independent fashion designers who are selling sustainable fashion online and via independent stores. Since environmentalism is now chic many fashionistas now insist that their clothing is cruelty free and environmentally friendly and not made using sweatshop labour. Many of these fashion designers also donate a percentage of their sales to various charitable causes, whether they be PETA or groups which promote environmentalism and/or fair trade (anti-sweatshop labour). 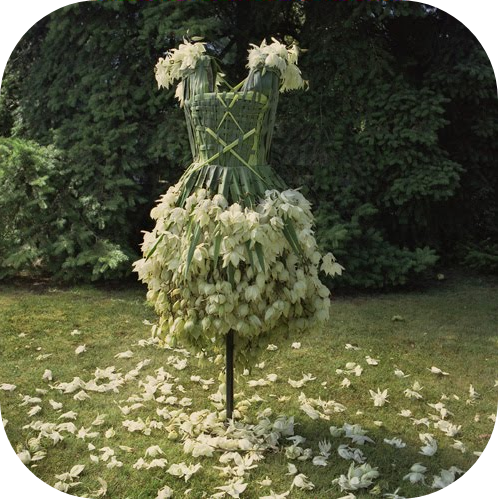 Eco-conscious clothing is becoming the forefront of fashion design. 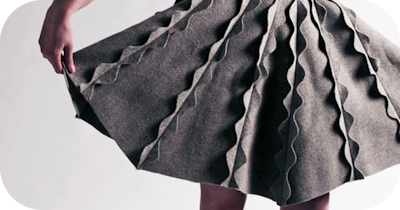 The 80s (when fur was still haute) is long gone and various organizations are openly promoting sustainable designers. One such group is the National Association of Sustainable Fashion Designers, whose mighty purpose it is to assist fashion entrepreneurs with their business practices in an effort to force social and environmental change on the consumer level all the way to manufacturing. 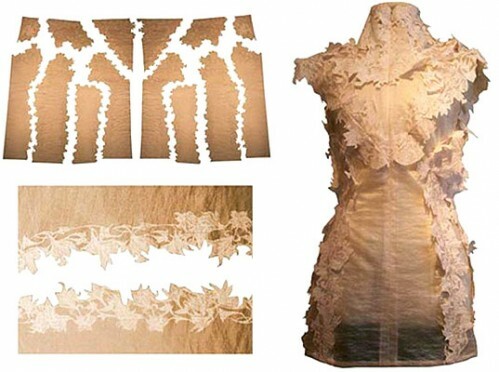 Smart companies are seeing this shift and are changing their manufacturing processes to made their clothes eco-fashion. Another group, Sustainable Designers, provides education, training, and access to industry tools and resources. A third group, Earth Pledge, is a non-profit organization (NPO) committed to promoting sustainable development (not just fashion, but in all manufacturing). "At least 8,000 chemicals are used to turn raw materials into textiles and 25% of the world's pesticides are used to grow non-organic cotton. This causes irreversible damage to people and the environment, and still two thirds of a garment's carbon footprint will occur after it is purchased." - Earth Pledge. The early stages of eco-fashion has often been referred to as "hippy clothes", but this isn't true of modern sustainable fashion designers who are incorporating sustainable materials and practices with professional high-quality designs. Due to the effort to minimize harm to the environment and fair trade manufacturing the clothes is significantly more expensive than clothing produced using sweatshop labour and cheaper fabrics. But therein lies the advantage: Better quality fabrics last longer and the quality of the designer means it is clothes you will wear again and again because you enjoy it so much. Some celebrities also have eco fashion brand names set up because they believe so strongly in the product. Some companies like Rapanui even use Vestas Wind Turbines to power their textile mills because they don't want to use conventional (coal based) electricity. 35% of electricity used in North America is from coal and many other countries are even more dependent on coal for the electricity. It is important to sustainable fashion consumers that every stage of production is sustainable and doesn't hurt the environment, and thus brands have to be very transparent about their processes, production and even transportation. #1. What is the source of the fiber? ie. Acrylic is made from petrochemicals derived from crude oil (from Iraq and other oil producing countries). #2. Is the fiber renewable? Can it be regrown from natural sources? ie. The world's supply of crude oil will eventually run out. #3. How is it transformed into fiber and does the process harm the environment? #4. What is the working conditions of people producing the materials? Is their hiring practices harmful to the locals? #5. What is the carbon footprint of the material during its lifetime? The most commomly used material is cotton (which is chemically intensive and therefore controversial) and cotton uses 25% of the world's insecticides and more than 10% of the world's pesticides. Thus organic cotton is considered to be the fiber of choice. Some eco-fashion designers also use Jute, Flax, Hemp, Ramie, Abaca, Bamboo (used for viscose), Soy, Corn, Banana, Pineapple, Lyocell (wood pulp), Polylactic acid (corn starch, tapioca and sugarcane fibers) and Beechwood (used for rayon). Protein / Animal based fibers include: Wool, Silk, Angora, Camel, Alpaca, Llama, Vicuna, Cashmere, Mohair. Sustainable fashion designers prefer to use recycled materials from old clothes when using these fibers so that they keep such materials out of landfills and prevents the killing or harm of more animals. ie. Modern silk is made by boiling silk worms alive. Recycling and "reclaiming" fibers from scraps of fabric thrown out by clothing factories is also a trend. The scraps are reprocessed and spun into new fibers. Sadly there is very few facilities able to process the full range of recyclable fibers and add fresh acrylic fibers to the mix to maintain fabric strength. Recycled, reclaimed, surplus and vintage fabrics are arguably the most sustainable choice, as the raw material requires no agriculture and no manufacturing to produce. Organic cotton (pesticide and fertilizer free) and exploring other alternative fabrics is a growing aspect of the sustainable fashion movement. Some manufacturers are experimenting with bamboo fibers because bamboo doesn't need pesticides and grows easily, but the problem with bamboo is the chemicals required to turn into a soft pulp that can be used for creating fabric. There is also a new dyeing process called AirDye technology which doesn't use water during the dyeing and printing process. It still uses chemicals in the process, but it dramatically reduces water consumption and pollution when compared to dyeing cotton (organic or non-organic cotton). There is a lot of ways consumers can also cut back and make their wardrobe more sustainable. #1. Stop buying so much clothes. Do you really need so many pairs of jeans? #2. If your old jeans still look haute on you keep wearing them. #3. If the jeans are torn to pieces take the pieces and make something new out of them. Wash cloths if necessary. Any piece of old fabric can be used for something else. FACT: In 2008 in the United States approx. 8.78 millions of tons of textiles were manufactured. Thanks to eco-fashion 1.45 millions tons were recovered and saved from landfills resulting in a rate of almost 17% recycling. (Source US EPA 2008 Report on Municipal Solid Waste.) That means eco-fashion is growing strong and has a long way to go. 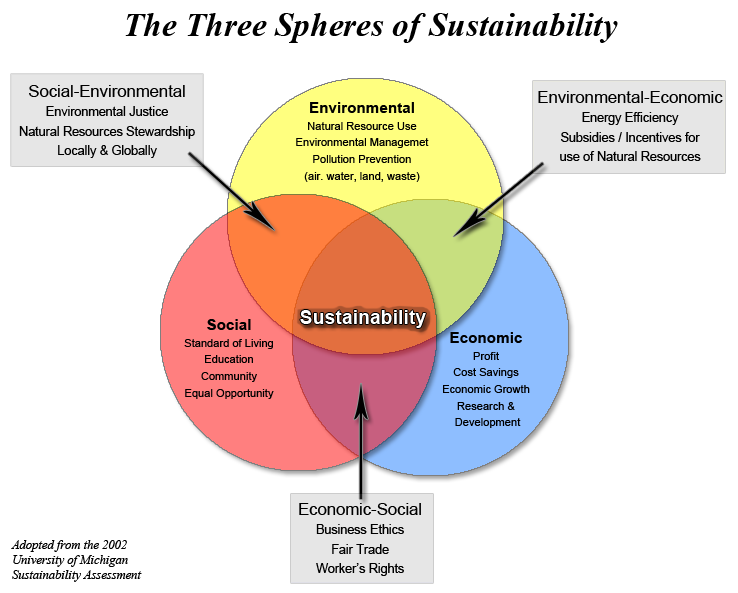 These are the �Three Legs of Sustainability�. Economics keeps people working and creates jobs, ecology means we're not harming the environment and social equity means the workers are being treated fairly. After all, do you really want to wear shoes made by 7 year olds working in a sweatshop labour camp where they are beaten if they don't fill their daily quota? Another way to improve conditions is to donate clothing to charity or do a "clothing swap" with a friend. There are even clothing swap websites where you can trade your old clothes. They include Dig N� Swap, Rehash, Swapstyle and thredUP. �I think about the suffering that may have come with them and it makes we want to shy away." - Alicia Keys, R&B singer, on why she doesn�t like diamonds. "I want to prove to the industry that there�s a viable alternative financial model the world can benefit from. The effect of the clothing industry has more impact on climate change than if the entire world signed the Kyoto Agreement." "It�s got to be fashion and not what people perceive as �organic fashion� � those hippie, oatmeal type of clothes � they have to be gorgeous clothes. Otherwise, no one would buy them." "The fashion industry tends to attract people with serious personality defects. They just want to be rich and famous. But at some point you have to decide: Are you going to mindlessly go the easy way or are you going to go the ethical way?" - Katharine Hamnett, British Fashion Designer. "First it�s the clothes; then it�s �Why does this feel so good?� And then they notice the hangtag. Our company motto is to smash old ideas of what you thought �eco� was." - Linda Loudermilk, Fashion Designer. I admit to having worn suede and leather myself for a while, but you just never felt clean, and it�s degenerate anyway to use animal skins." - Andy Warhol, Pop Artist. Sustainable clothing is here to stay. In North America we live in a society which, if anything, has TOO MUCH clothes. We can certainly afford to cut back on how much clothes we buy, how much we consume heedlessly and buy better quality sustainable clothing instead when we do actually choose to get more clothing.